Aquatics is an important part of recreation programming, however many municipalities are currently dealing with aging facilities and/or experiencing a decrease in usership. This roundtable will discuss current trends in building a new or renovating an existing aquatics facility, what has worked and what hasn't with regard to resident and nonresident sales, and possible revenue generating ideas municipalities can use to offset costs. After lunch, grab your team of staff and join CRPA and Black Hall Outfitters for this exciting team building exercise! 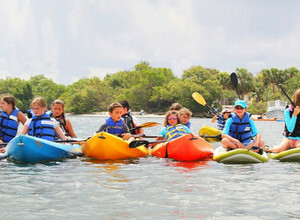 Your team will learn how to work together to accomplish a paddling-scavenger hunt on the pristine waters of the Great Island National Salt marsh Sanctuary. Enjoy the early autumn landscapes and paddle to Great Island with your team as you work together, set a mission, and have some FUN! Join us as we work together to accomplish a set goal while honing your communication skills in a new environment with new challenges!